Do you want to automate a small-sized gate, which is quite a common size for most residential areas? If you have a gate and are looking for a gate opener for it, you might have come across online ALEKO AS900 reviews. Although much information is available online, there can be too much that it may already be overwhelming. In this review, we combined all the information in a more organized way to make it easier for you to make a decision. The ALEKO AS900 is a dual swing gate opener specifically designed for smaller sized gates measuring up to 10 feet in length and up to 500 lbs. in weight per leaf. It is produced by the ALEKO company, which was established in 2005 and is based in Seattle Washington. They are known for producing high-performance gate openers that come with full warranties. For the price, the ALEKO AS900 is a good swing gate opener for dual swing gates that are on the smaller side. It may be slow to open and close but it is easy to install and it is affordable. This gate opener can be powered by simply plugging it in or by using a battery. They suggest getting an automotive battery, which can also be connected to a solar panel for charging. Because this is made for smaller sized gates, it requires less power in order to open up the gate. The openers of each leaf are also small in size and they won’t look very bulky on your small gate. The soft start and stop feature makes the movement of the gate slow during the start and towards the end of its destination. This helps prevent your gate from banging or abruptly stopping and adding to the wear and tear of your system. This gate opener can be easily installed not only on ALEKO gates but other gates as well. It comes with mounting accessories and you won’t need to weld anything to use it. The ALEKO swing gate opener manual also comes with the purchase but you can also find it on their website. The ALEKO AS900 Basic Kit Gate Opener is currently available on Amazon. The two openers are meant to be used on each leaf of your gate and it can be installed in such a way that the gate opens inwards or outwards. It comes with a warranty but the warranty depends on the seller of the product and you have to contact them to ask about it. It can be run with a battery but the battery isn’t included in the kit. The ALEKO AS900 gate opener is an affordable product for smaller gates, such as those found in residential areas. 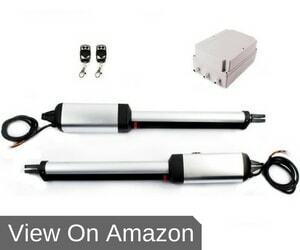 We recommend that you buy it if you need a gate opener that is easy to install and use. It also provides various options on powering it, so you can simply plug it in or use a solar panel for a more environment-friendly use.